Recently I’ve seen a lot of people referring to the new Netflix show Tidying Up with Marie Kondo. It follows the lasting popularity of her book The Life Changing Power of Cleaning Up (2011). Who could have guessed that tidying up would become a hit topic? Kondo’s success is part of the recent popularity of pursuing personal wellbeing and ‘wellness’. She presents the decluttered home as a very significant part of leading a good life. Her message is about ‘sparking joy through tidying’. Her key question for whether to keep something that you own is to ask whether it gives you joy. It might have once, but does it now? If not, get rid of it! Her philosophy is about becoming more sensitive to how we feel about what we own and only keeping what really matters to us. This might sound simple but the results can be profound. I’ve heard of people getting rid of up to 75% of what they own as a result of reading Kondo’s book. It’s impact on some people has been immense. It isn’t just about tidying up. The message has been nicely summed up as personal ‘transformation through tidying’. Many people find it hard to declutter because of the sentimental value of what they own. Sentimental items can feel like they somehow force you to hold on to them even if you know you don’t need them. A core part of Kondo’s method is thanking our items for what they have done in our lives, and then letting it go of them without guilt. This is a very significant psychological strategy. It enables a person to mark off the end of their owning an object with a spirit of gratitude rather than guilt, which then allows them to dispose of it without agonizing over it. At a practical level it gets the decluttering process moving. If you have to agonize over every second thing, you can expect decluttering to get derailed quickly! There is a great deal in Kondo’s philosophy that is good and useful. The Bible warns about how greed is idolatry (Colossians 3:5; Ephesians 5:5). Of course, no normal greedy person bows down to worship their wealth like someone who literally worships an idol. Greed is idolatry in the sense that it leads us to give the kind of trust and devotion to our possessions that can only properly be given to God. Greedy people rest in the security of their wealth rather than in God’s provision. If greed is idolatry, then hoarding is clearly an activity that Christians should be wary of! Very often our accumulation of stuff is evidence that we have put our hope, trust and allegiance in material possessions rather than in God. Thus, Jesus commanded us to not spend our lives worrying about our possessions (Matthew 6:24-34; Luke 12:15). Instead we are to be content with what we have (Hebrews 13:5). Love of money is an enormous danger to our devotion to God (1 Timothy 6:7-10). That means that decluttering our lives and living more simply is something that Christians ought to consider very carefully. However, the opposite of hoarding can also be idolatrous. I’d never seen an example of it before, but in Marie Kondo’s philosophy we can see that even anti-hoarding can be idolatrous and self-serving. The key problem is with Kondo instructing us to direct thanks to our possessions. Let’s not sugar-coat it; the Bible teaches that this is a wicked and idolatrous thing to do. God ‘richly provides us with everything for our enjoyment’ (1 Timothy 6:17). Since God is the ultimate source of all that we enjoy, we ought to be grateful to him and not to the things that he gives us. Gratitude towards inanimate objects is not only strange, but offensive to God. It is a form of spirituality contrary to the gospel. If you think that thanking objects for the joy they give you is harmless, then I dare you to try the following. The next time you get given a present that you really, really like – something that gives you immediate joy – make sure that you thank the present itself for giving you joy. Make sure that you ignore the person who gave it to you. Don’t thank them. Thank the present they gave you instead. After all, its the thing that gave you joy, not the person! Obviously we shouldn’t treat other people that way (especially if we ever want another present from them again). We must be every more careful not to treat God that way! The Bible teaches that lack of thankfulness towards God is one of mankind’s most widespread and significant sins. People refuse to thank God for what he gives them. They instead direct their devotion and thanksgiving to inanimate objects: idols (Romans 1:21-23). Kondo’s practice of thankfulness to possessions is a modern, semi-secular version of old-fashioned idolatry. Thankfulness sounds like a lovely, positive idea. But when we give thanks to inanimate objects instead of to God who gave them, we are engaging in idolatry. It’s actually our lack of gratitude disguised as gratitude! It ignores the giver entirely. I’m not condemning Kondo’s work entirely. Far from it! Christians generally can’t entirely affirm or reject cultural practices. There is both good and bad in it. 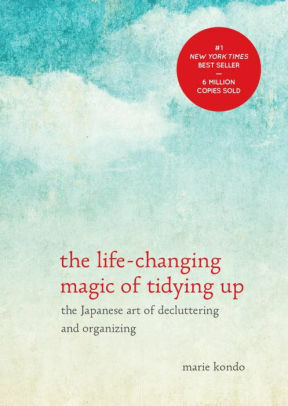 Kondo’s decluttering method – and virtually everything else in culture – has good in it that we can benefit from. However, Christians must take care not to adopt unhelpful practices and ideas, and especially not anti-Christian ones. Instead we should recognise that creation is good (though distorted by sin), and that very often useful practices taught by non-Christians can be transformed into God-honouring ones. Christians have lots of good reasons to declutter. We can employ Kondo’s method as described, but instead of directing thanks towards objects we must direct it to God instead. This is an excellent practice. Most of us thank God far to little for the many ways he is generous to us. Decluttering our materialistic lives is good too. I find Kondo’s way of positively ending our owning an object very attractive (once the misdirected thanks is changed). What an excellent way to thank God for the way he has blessed us in ways both big and small!